This Japanese Cheesecake makes most people crazily addicted and willingly die for. It stands out the crowd of all kinds of cheescakes. Wondering why? When I tried the Japanese cheesecake with the very first bite, I have been fallen in love with it ever since. The velvety smooth, creamy, as well as the fluffy texture makes this kind of cheesecake stand out the crowd. The cheesecake is not too sweet, yet just enough to entertain your sweet tooth if you have one. Mind you, the cooking method makes the cheesecake very light, you’d feel you don’t have enough even after having a big slice of it. A case in point, over half of the cheesecake was gone shortly after I placed it in the fridge. I didn’t blame my daughter at all, because it’s so intriguing. Who can resist it? 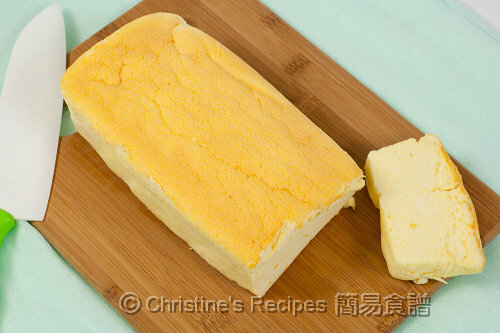 This kind of cheesecake is always a big hit in Hong Kong and other Asian countries. Just hop over to my Chinese fan page and browse the comments asking for more tips, you’d know what I’m trying to say. Firstly, the surface of cheesecakes has a tendency to crack during or after baking. Secondly, the cake would easily shrink as it cools down. Although the taste remains the same, I believe every baker, like me, would love to see a perfect, or at least a good, pleasant looking cheesecake being served before your or your loved ones’ eyes. I’m not a professional baker, just like all other home cooks, love baking some delicious desserts to feed my family. Here I’d share what worked for me. Feel free to drop a comment to share what I miss in this post, or what methods worked for you when making this cheesecake. Baked the same batch of batter in a silicon mould and a lined baking tin. Found that the baking tin produced a cheesecake with better texture. Preheat oven to 150C (302F). Combine cake flour and corn flour. Sift in the flours into the cream cheese mixture, a small amount at a time. Mix well between every addition, and make sure there aren’t any flour lumps. Stir in freshly grated zest. Set aside. Fold-in the egg whites into the cream cheese mixture gently with a rubber spatula just until all ingredients are incorporated. Do not stir or beat. For a better result, fold in egg whites with a small amount at a time, at least for 3 times. (Please refer to this post with video: How To Fold-in Egg Whites). Pour the mixture into the two baking pans. Place the pans into another larger baking tray. Add hot water in the tray up to half way. Bake for about 50 to 60 minutes. Test with a needle or skewer that comes out clean. Turn off the oven. Leave the oven door ajar for 10 minutes. Remove from the oven and remove from the pans. Let cool completely on a wire rack. Chill in a fridge for about 3 hours. Enjoy! Get cream cheese block to make this cheesecake. Don't ever use the cheese spread. Your cheesecake will be too wet otherwise. The delicate, velvety smooth texture of this cheesecake is produced by two low-protein flours, cake flour or corn flour. The beaten egg whites generate very small air pockets in the inner structure of the cake. So, when it comes to making this cake, it’s very important to know how to beat egg whites and how to fold-in egg whites properly. I’ve uploaded two videos on youtube for those who need them, here and here. To prevent the surface of the cheesecake from cracking: use low temperature and water-bath method during baking. The surface of the cake has a tendency to rise high to a point that breaks the structure. So, the basic principle is to keep the oven as low as the recipe suggests as 150C (302F). Mind you, every oven is so different, know your oven. And you have to keep an eye on it when baking. When the cake surface rises too high, that means the temperature of your oven is too high. Reduce the temperature accordingly. To prevent the cheesecake from shrinking: open the oven door ajar for 10 minutes or so, and let your cheesecakes cool down gradually. But don’t keep them there too long because moist would develop at the bottom of the baking pans. If using a loose base cake tin, cover the outside of the tin bottom with double layers of aluminium foil to prevent water from seeping in. yes~ This recipe has always been a winner among Asians :) Lovee it! I have been trying to perfect this cheesecake and i think i have sort of am getting there. Will post my findings in my experiment asap. I am so intrigued now; I have never been a fan of american-style cheesecake because I find it too dense and too rich; this one looks so delicate, it is really worth trying! thanks! i love japanese cheesecake too and whenever i bake this, i have to be so alert all the time checking my oven to spot on unwanted cracks! This is certainly one of the prettiest Japanese-style cheesecakes I've seen. It looks like the softest cloud imaginable. I've always wanted to try Japanese style cheesecake! Yours looks absolutely delicious and beautiful! is corn flour the same as cornstarch? i don't think i've found corn flour at my local grocery. i really want to try making this. looks heavenly! We call it cornflour in Australia, the more or less the same as the one called corn starch in US. That texture looks fantastic! I've bought this at the store and love this cheesecake that's so different from the American versions. hi where can i find cake flour in sydney? i grew up eating jap cheesecake...and just love it! the texture and how it's not as dense and sweet as the western version! Hi, I love your blog and have been visiting your blog regularly. I was very happy when I saw this Japanese cheesecake recipe, having just came back from Japan, I love this Japanese cheesecake. So I made two today by using your recipe. The texture is great, but the top cracked while baking. Any idea why? The problem of cracking is very common. The main remedy is to control the temperature of your oven, keep it low. Try not to let the surface of your cakes rise too high. Thank you very much Christine, I will make another one tomorrow and lower my oven temperature. Though they cracked on top, the texture was really good, no sinking or shrinking. The two cakes were gone within minutes. I really love your blog. Thanks for introducing me to this, if not I would possibly have never known about japanese cheesecake. It looks positively delicious and velvetey. I have yet to try and bake this. On the list as well. Love Japanese cheesecake.... so fluffy and light! Hi Christine, I thought I would drop by to let you know that I just finished making the Japanese cheesecake again today, after it cracked when I baked it the first time yesterday. It turned out perfectly fine today. I am so happy. I turned the temperature lower while half way baking. Seems to work. Thank you so much. Good news! You're so persistent to bake this cake perfectly. Congrats on your success. And I believe your feedback here might help many other readers who are new to baking this kind of cheesecake. Thanks for your input. Hi Christine! I tried baking this cake today - it is still cooling on the wire rack but I already don't have a good feeling! It seems to really have shrunk and felt heavy when I transferred it to the wire rack. Is it to do with the folding of the egg whites? When I was pouring the batter into the cake tin, I realised the mixture at the bottom had not been mixed very well. Or do you think perhaps some water has flowed into the cake? I used a square tin with the removable base. Wow, it looks so creamy and light! I tried this once and it broke into half when I removed it from the tin =( must try again! This looks so incredibly light and fluffy. I am sure it tastes delicious...! Hi Christine, I can't find any cake flour in San Francisco. Can you tell me what it is called in Chinese? Maybe I can find it in Chinese markets. If not, is there a replacement? Thanks so much for your help and your blog. It's called 低筋粉。You can get it from any Asian stores. It's a kind of low protein flour. Fluffy and creamy, they are calling me too! Such a cheesecake, I can eat more without feeling overburdened on my stomach. The richer New York-type cheesecake - I can just take a small slice ! Highly likely that your guess was right. The water and the batter not mixed well were the causes. If you use removable base pan, it must be wrapped with double layers of aluminum foil to prevent any water from sipping into the cheesecake while baking. Very soft moist texture, light and delicious. Thanks for the tips! I am yet to attempt making a perfect Japanese cheesecake. Your post has encouraged me to try it soon. I made the cake today and it did not rise. The cake still turned out fluffy and moist. Any reason why the cake did not rise? I baked it for 1 hr at 300F. Also, the top did not brown like it did in your photo. It was the same color as the centre of the cake. It still tasted really good! If your cheesecake didn't turn brown enough, probably the temperature of your oven is too low, that's too low not enough to brown the surface of your cheesecake. You could increase the oven temperature a bit higher when it's almost done, to "brown" the surface. Once it browns to your liking, turn off the oven, or else it'd crack. Wow, the velvety texture of this delicious looking cheesecake sounds amazing! I live in UK, it seems that there is no cake flour here only all purpose flour, can i use it instead? Tnx! Yay! I first saw this when a relative "liked" it on the Chinese fan page. Saw a photo of it again on Photograzing. Great. Let me know how it goes if you make it. it is supposed to be eaten just like this, or with jam or something like that? This cheesecake can be eaten as it is, and my family and friends like this way. Some people add some fruit and cream with it. More than any other blog post today yours has made me insanely hungry. So need some Japanese cheesecake now. Yours looks so good! Hi Christine, for some reason, my cheesecakes came out wet on the inside. I baked them for 1 hour and 15 minutes on 325 degrees. The toothpick came out clean, but when I tried them, it was still very moist on the inside. Any idea? Even my second attempt was the same. It was so disappointing. The flavor was great, fluffy and delicious. Great recipe, but it seems like I cannot get it right. Thanks! It seems that too much moist was created during baking in water bath. Is your oven too small? You might like to remove the tray of water in the last 15 minutes or so, just quickly pop the cheesecake in the oven and continue to bake until done. This will help decrease the moist. 1. this recipe uses 250ml milk whereas other similar recipe uses 100ml milk. Do you know what is the major difference in the result of the cheesecake if i were to use 100ml milk? 2. is it better to add all the sugar into the egg whites compare to adding half amount of sugar to egg yolks and half amount to egg whites? Or it does not make any difference? Should run an experiment to compare, then. I'd predict that more milk will make the cake more moist in texture. I think you can test out how many milk will suit your taste. Hey Christine! I want to make this recipe today and I was wondering what would happen if I didn't use the lemon zest? The lemon zest is to add fragrance. You might skip it if you don't like. It doesn't affect the taste and texture. Great to know you made it and loved it. Hi Christine, I just baked this cheesecake. Both are stuck in the baking pans. First loaf, only half came out. The second one won't even come out. I have placed both in the freezer to cool it down faster. Any reason the cheesecake would be stuck? Did you line your baking pans with baking paper? Hi! if i just made half the recipe, to fit it into one loaf pan, may i know how long i must bake it for in this case? For this recipe yields two loafs, but baked at the same time in oven. So if you want to bake only one loaf, the baking time is the same. My cheesecake taste like eggs with sugar. It didn't can out right. It's not fluffy at all :( Why is like that. Is it because I didn't add cream of tartar?? Probably that your egg whites were not beaten well or the air insdie escaped while folding the batter. @Anonymous Thank you Christine for this wonderful recipe and your step by step blog. I can't wait to try it out! For the comment above about not being able to find cake flour in SF. I believe Safeway or most other supermarkets carry it. The brand they carry is called Swan Down cake flour. Hi Christine, I really want to try to make this, but I don't know what is cream cheese, is it Brie? You'd find cream cheese easily at any supermarkets. Got "cream cheese" written on the packets. Hi Christine, I gave the Japanese Cheesecake another go today. I lined both my baking pans (one pyrex and one the aluminum) with wax paper. Both came out nicer than my first try. The one i baked in the pyrex didn't fluff up as much. The one i baked in the aluminum came out fluffier, but there's still cream cheese on the bottom of both...thicker from the pyrex. Any idea why? You might've noticed that I used a metal baking tray and a silicon mould to bake 2 cheesecakes at the same time, shown in above picture on this post. I also found that the one in silicon mould didn't puff up as much as the one in the metal tray. Quite silimar to your experiment. Guess that different baking utensils have an impact on producing different end results. Highly likely that metal or aluminum trays conduct heat quicker than those of glass and silicon. Can I use the cream cheese in cup rather than the block type? Is it okay to leave out the lemon zest? And is the butter the normal one or salt-reduced? The lemon zest is to add a fresh fragrance to the cheesecake. You might omit it. I used unsalted butter. Hi Christine, I tried to make this cake for a number of times and it seems like everytime the cake just shrink after it's cooked and I open the door ajar. Any reason why? Can we fill the baking tin to the rim ?or do we fill up the baking tin to 80% ?? How r u? I tried your recipe steamed cake(dim sum) it tastes very good and delicious. My children love it so so so much. Thank you very much for your help! I need your help! What is the different between corn flour and corn starch? Can you show me the picture of the corn flour if you can, because I have been looking all over the market in new York city, they did not carried,please tell me where I can find it. I am very appreciated it. Thanks! Are you living in US? We call it cornflour, more or less the same as the one you call it as corn starch. I posted a picture of cornflour on this previous post. This receipe is fantastic. i have never thought i will able to bake a cheesecake. Your problem is quite common. Highly probable that the egg whites weren't beaten well or the air in the beaten egg whites was knocked out while folding in the batter. 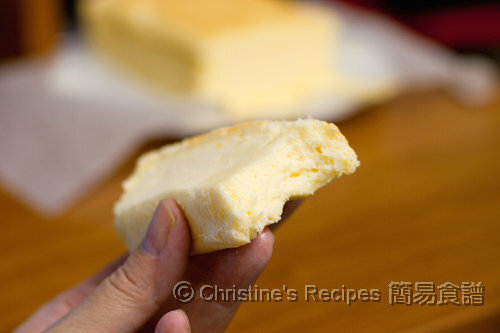 is this similar to the chinese sponge cakes from HK? Quite different as this one added cream cheese. hi Christine, Im very interesting all your recipes. I have try follow your recipe to make egg tart b4, very nice. 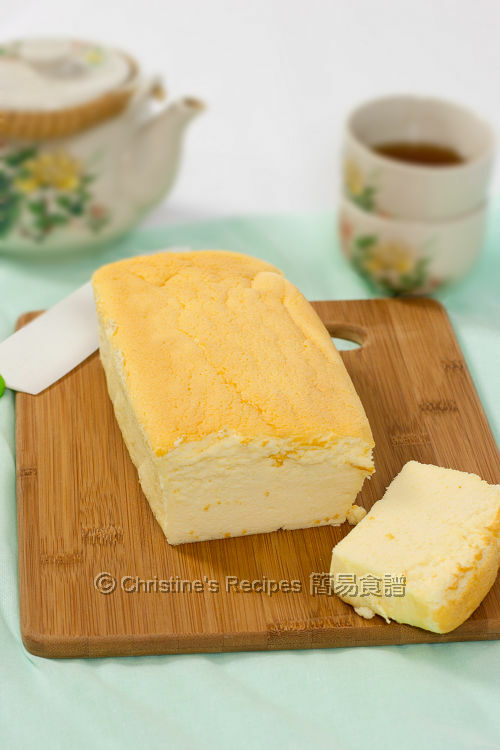 Here want to know, if i no cake flour, can i replace other flour to make this Japanese cheesecake? what kind flour is suitable to replace with cake flour? thank you! Cake flour is a kind of low protein flour with 6 to 7% protein. You might use 44 grams of plain flour and 11 grams of corn flour/corn starch to replace the 55 grams of cake flour. This cake won't rise very high. So don't expect it's like those birthday sponge cakes. What is the corn starch for? Is it ok if i just use corn starch to bake? what does 250gm of cream cheese equal to? like half a bar? DO u beat the egg yolk with the electric mixer ? Do you think it's ok for me to use self raising cake flour? As self-raising flour has got leavening agents mixed in it, I'm afraid the cake made from it wouldn't be delicate, nor up to your expectation. You might have some big holes inside the cake. Is cake flour same with plain flour? What I used for making this dessert is one stick of cream cheese, that weights 250 grams. But you have to make sure whether you get the same weight, because it might be slightly different from brand to brand. Plain flour and cake flour are different in many ways. Take a look at this page for more details. Firstly, it seems that your cake was not cooked through yet, so it's moist inside. Secondly, many possible causes make a cheesecake sink after it cools down. The most common cause is the egg whites hasn't been beaten well or not folded in properly. Firstly, I'd like to say how much I love your blog. It is so inspiring and the recipes look so tasty. Thank you for sharing them. I tried your cheesecake recipe. The cheesecake came out fluffy, creamy and moist, it was very delicious. However, it shrank, even though I opened the oven ajar. Do you think it is because I didn't use cream of tartar ? Or because it wasn't thick enough (I had no choice but for using a bigger bakin pan) ? Your cheesecake might have been puffed up by the high heat in oven. When it comes to baking this cheesecake, we have to use low temperature. Yes, cream of tartar can help stablize the beaten egg whites, and the cake won't easily shrink back. Don't need to turn your cake upside down after removing from oven. Just remove the cheesecake from mould as this cheesecake is quite moist, water would be condensed at the bottom otherwise. I just done the cake, now chill in the fridge. The cake looks nice and pretty. But I saw the the bottom part is creamy.. Not sure is like that? Just afraid that mascarpone cheese would be too moist for making this cheesecake. If you want the best result, the cream cheese stick is the most suitable. (1) My cheesecake cracked very badly, what should I do? (2) As for the water on the tray, must be it half or as long as there is water its sufficient? Hi Christine, loving your site! I want to try to made this cheesecake but in mini muffin tins. Do you think it would work and how long do you think the baking time would be? You might cook through the cheesecake with mini muffin tins. But wonder if the mini cheesecakes would shrink once they cool down. If you don't mind, it still worths trying. Concerning the cooking time, it depends on the size and material of your mini muffin tin. Keep using low temperature, and test with 20 to 30 minutes first, see how they go. My cake turned out as if half uncooked on the bottom and I baked the cake for one already. Is this how it is meant to be? At first my egg yolk mixture was watery but I followed your 250ml milk....please can you advise what had happened? How's your batter after incorporating flour and egg whites finally? Was it watery? If so, it's not right then. The common cause of an uncooked cheesecake is either of the heat of the oven, or the baking time. After the baking of 1 hr yesterday, the cake turned out to be half jelly and half chiffon cake. The chiffon cake part was edible and my family relatives said it's really moist and tasty even better than other chiffon cake recipes I tried too. I am determined to bake another still. The issue was that my final mixture yesterday was not too watery/liquidy after incorporating the flour and egg whites. It was liquidy before the egg Whites were added compared to my other chiffon cake bakes and I had a feeling it would fail before it was cooked. Could it be the cheese I used, Because I used Premula cheese spread? The tub version?? I also microwaved my butter and milk because I was a bit impatient with steaming the milk To mix with the other ingredients. I will try again with a different cheese? Thanks. I just baked this today, and I had the same problem as Thu! The bottom 1/3 of the cake is uniformly pudding like while the top 2/3 seems perfect. I used a cake tin (instead of springfoam pan) for baking so I don't think it's water from the water bath seeping into the batter. Do you have a suggestion for this problem. Would love to try the recipe again, but I need to know where it went wrong at the first place. Help! I guess so, if you used cheese spread, it's too moist, not suitable for making this cheesecake. I used the cheese stick. Next time, you might want to try. It could be the problem of folding in, or the water in pan too hot. Thank you for sharing your recipe. The picture of your cake looks perfect. Unfortunately, mine did not turn out as nice. Like some of other guests, my cake came to be half bottom jelly and top cake. I noticed the egg yolk mixture was really watery even after mixing in the flour. I was afraid that it was too watery at that point so I even added in another tablespoon of cake flour. Even adding this, it was still watery. I was not able to find cream cheese in 250 gram pack. The one I found was 226 g. I was wondering if that could have make the difference. I am wondering if the 250ml (1cup)milk is too much? After incorporating the egg yolks into the mixture, it seems it needs twice as much flour to make the mixture thick (like the one in your YouTube video). The taste of the cake is delicious. I hope I can bake this successfully. Yeh I bought the Primula cheese spread Because it was buy 1get1 free, also it didn't say it was a spread and it was placed in the same place as the cream cheese. I was astonished when I opened the film...and thought oh no....but thought I give it a try because I bought 4 tubs!! My usual cheese cake recipe also failed with this ingredient!! I will try again because I cannot help being fanatic in baking and making food!! Thanks Christine...also I had put in a hot water Bath before start of cooking, I will try cold water maybe tomorrow!! Get the quality cream cheese stick, the taste and flavour is better. It worths every dollar. Fill at least warm/not too hot water in the pan for water bath. Don't use cold water, otherwise the temperature of your oven will decrease and would affect the result. I tried it again this time without the water bath and baking for 1.5hrs time 150 degrees; However The mixture uniformed together but it is still slightly wet with 3 extra tablespoon of flour on top of your 55gm flour. I think I need to try reducing the milk amount. Is it to do with the US weight measures? Like another person said recently, 250ml is equivalent to UK's one cup measure. I think I still enjoy your recipe so I will try again....Soon. The material of cake tin also brings much impact on the end result too. And what size of cake tine did you use? I used two small cake tins, shown on this post, that would help the inside cooked through easily. Hi Christine, I used two loaf tins. Your picture look like loaf tins so I did the same as your tins were also fitting in the large baking tray too. what kind of milk you are using? is there any difference between fresh milk, UHT milk, and full cream milk? I wish I can understands more on UHT milk. is quite confusing. For making this cheesecake, I used full cream fresh milk. Both fresh milk and UHT milk have undergone pasteurisation and homogenisation before packaging. Fresh milk is often stored in chilled section in supermarkets. UHT milk is also called long-life milk as it has had extra treatment so that they can be stored at room temperature, but once they are opened, they have to be chilled in fridge. Full cream milk is referring to the quantity of fat content, about 3.5% to 4% milk fat. i just baked the cheesecake, and accidentally left out the corn flour. it seems to turn out fine, may be didn't rise as much? tasted great and fluffy! i will make sure to follow the recipe next time and compare the results. i just made this cake and it taste awaesooom!! thank you soooo much for sharing the receipe with us!! I tried this recipe the other day, and it turned out PERFECT, just like in your photo. Everyone loved it and I think I've gotten a bit of a reputation for being an exotic baker now =P (I, nor anyone else had ever heard of or seen Japanese Cheesecake here in New Zealand). It was beautiful, thank you so much!! So nice to read your feedback and happy for you. You're really a great baker coz you can make it perfect at the first attempt. Congrats on your big success. Thank you for loving my recipes and support ! I made this cheesecake today for my son's bday, and it turned out perfect on the first try. It is so delicious, fluffy, creamy, moist, and it melts in our mouth. I never like cheesecake until I ate this Japanese version. It is soooo delicious. My kid almost finished the whole cheesecake. I'm glad I didn't do half of the recipe which I thought about doing @ first. Next time, I will make double of this recipe. Aw, so glad to read your feedback. Belated happy birthday to your boy! You could use 44 grams of plain flour and 11 grams of cornflour/corn starch to replace the 55 grams of cake flour. So, for making this cheesecake, you might use 45 grams of plain flour together with 30 grams of corn flour. I desperately need your help. I baked this cheese cake twice using the recipe from little teochew & both time I failed miserably. My cake shrunk & the inside is like steam kueh. I even went thru your video to make sure that I did the folding & beating of the eggwhite correctly. The thing is, i can bake pretty good chiffon cake & orange cotton cake which both has abt the same method but dont know why I fail this so badly for this. Any advice? Thanks so much for dropping by and watching my videos. If you have mastered the skills of beating and folding-in the egg whites, it shouldn't be any problems for you to make this kind of cheesecake. I think it's better to ask the recipe writer, she might have some ideas of helping you to sort the problem out. May i know where can i get cake flour in Australia? You can get cake flour from any Asian grocers. Oh wow, I've been looking for this cheesecake recipe for so long! I remember my dad buying it from the supermarket when I was younger. I always googled light and fluffy cheesecake but never found anything lol! Thank you!! I can't wait to try this. I tried the recipe by using half of every ingredient as i was short on eggs. I used super fine floor instead of cake floor (I was informed that it's the equivalent of cake flour). The cake turned out so delicious & fluffy, just like the one in bakery! My boy and hubby both love it and my 2.5 year old kept asking for more. Second time round I tried replacing the lemon zest with orange zest instead, doesn't taste as zesty. Will stick back to lemon next time. 1) Your recipe does not call for 'salt' to be added. Any reason why salt is not required? 2) I baked in a 1 balance small portion in a cupcake mould as I was afraid main tin will overflow. The cupcake texture is different from main tin. Cupcake being fluffier, moist-cakey texture at top and much dense at the bottom, but really yummy. For the main tin, after cooling, it tasted mousse-like but after refrigerated, it's really nice. Maybe I should have baked longer as tester came out wasn't totally clean after an hour of baking. Any reason to the difference in texture although same batch? 1) The cream cheese has already got salt , so I didn't add any salt. 2)Different utensils impart different effects on the end result. Please take a look at the picture above on this post, I also found the texture of the one baked from silicon mould was very different. But I like the one from the tin tray. So I keep using the tin tray to bake this cheesecake. hi christine...HELP!!! !i tried to look for cornflour but unfortunately i couldnt find one...does cornflour and cornstarch is the same? ?i saw one in the grocery it says cornflour but its yellow color that we use for corn bread,is that the one? ?=( please help. The cornflour we use here is quite similar to the corn starch in US. You might use corn starch for making this cheesecake. I tried this recipe, following your instructions with NO substitutes. I used the baking paper and the baking tin. Following your recipe carefully, it came out PEFECT on my very first try. Turned out so perfect I made two more. I recommend to anyone interested in this, to make sure you follow Christines instructions EXACTLY! if you live in the US remember Caster sugar is just granulated sugar blended in a blender! Don't use powdered sugar or regular sugar without blending it first! @Anonymous hi anonymous...i wanna ask to make sure did u use cornstarch or cornflour that we use for cornbread?? im a little confuse with this 2...=(...im based in the US by the way.thank you in advance. HI! Just to make this clear do NOT use CORN MEAL! Cornflour in the UK is CORNSTARCH in the US! I have converted Christine's recipe to measurements for the US and the oven setting. Oven: 300 Degrees, Middle Oven rack. @Anonymous this is awesome....thanks for ur help anonymous...i could finally now try this recipe...!!! Tried your recipe but there are some problem, the cake came out to be heavy dense bottom and the top got burnt (i bake at 150 C). Please advise. Thank you and Merry Christmas ! Can you use a 9 inch round cake pan instead of using the 2 tin pans? Would the cooking time be different? Yes, you can. But it will take much longer baking time to get the cheesecake cooked through. Use a needle to test whether it's cooked. hi,me and my friend made this 2 times but it didn't work and we don't know what went wrong. the inside of the cheesecake did'nt cook but only the top was cooked.Do u know why it didnt cook properly? Is it because there was too less water when we put it in the oven? is the corn flour you're talking about the same as corn starch or is it the same as corn meals? i got mixed answers from google. why my cake tends to crack on the top while it was still moist inside and also the top wasn't brown at all? pls help. We tried it today, and same issue as a lot of others....the inside was still wet....definitely not the same as your picture. Will have to retry another time! BTW, thanks for your awesome recipes!!!! I've just tried yesterday.it is so nice. i love it. Hi ...do you bake the cake on the top or middle shelf? My cake needed to be be baked for up to 80-90 mins at 150C on the middle shelf before it browned like the one in your picture. Unfortunately, only the top quarter of the cake was nice and fluffy. The rest was very dense. Do you have any idea what went wrong? I used the water bath as instructed. Thanks. I can not find cream of tartar, is there anyting else that i can use as a substitute of it?? BTW, I love your mooncake recipe!!! You could replace the cream of tartar with 2 teaspoons of lemon juice. Is the cheesecake suppose to brown as it bakes? The cheesecake will look better if the top is brown. If your cheesecake was not brown enough, you might increase the temperature towards the end of baking. i have tried this recipe for three or four times. the cake taste so nice just that the appearance not that inviting only. so i decided to try it again today. it turns out to be, the cake looks very nice, doesnt sink on the top but inside of the cake is somehow beehives like. i used brown sugar instead of castor sugar this time, is this the reason? I baked this cheesecake for the first time. It took longer for me to bake it. It turned out so well and tasty. Thank you for the recipe. Do you have a low fat version for cheesecake? Well I baked this cake today .. but the bottom was all cheese and the top part was all fluffy!!!... Just have to try again!! But thank you for ur recipie!! Hi, I'm also from Australia (Sydney), but I'm just wondering where do you get cake flour from? I got the cake flour from Asian stores, used unsalted butter. Hello Christine, thanks for sharing this recipe.. I'm very excited to give it a try! I'd like to check with you on something; what's the size of eggs you use - medium or large? Can you give me an estimate of the total weight of the 6 eggs you use for this recipe? I'm concerned about the cake smelling or tasting 'eggy'.. Haha.. Thanks! I used eggs, each whole egg of 56 grams. 6 eggs are about 336 grams. I used a 7" mould and got some mixture remaining. I tried to baked the remaining mixture in a rice cooker with "cake" mode function. It comes out with a brown base and when i put it upside down, looks exactly like those American cheese cake (a bit crispy). Can I send you the picture? You could upload your picture on my fan page. On the sidebar of this blog, there's a link to my facebook fan page. I tried this recipe and it came out perfectly first time! I couldn't find 'cake flour' so I used a gluten free blend with the same protein amount. I also used orange rind, with great success. My fan forced oven caused the larger loaf to crack at 40mins so I turned the oven down to 100c and gave it 10 more mins. I suspect that for fan forced ovens, 120-130c may be a good temperature. We shared the cheesecake plain the first night, and had it with rhubarb today, tomorrow maybe fresh raspberries will be great too! Absolutely delicious cheesecake with a wonderful texture and delicate flavour! Hi Christine, I'm wondering if this can be made as a chocolate cheesecake. Can you give me an approximate as to how much cocoa powder/chocolate milk to use? I tasted my friend's Japanese Cheesecake and it was delicious. She told me she got the recipe from here. So I came to this website and copied the recipe down in a book. I will bake it soon with a couple of other friends in a baking party. I hope it would be yummy! Thanks for sharing this! I baked one in silicone mould while another in a round tin and the round tin one turnt out with a slightly condensed layer at the bottom would you know what reason it could be? Dear Christine, thank you for sharing the recipe. I was wondering if it can be baked in a bundt pan. Please advise. Thanks. I've replied to the similar question before. Please take some time to browse the previous comments. I think you can use a bundt pan. You might need to adjust the baking time. On method #2: you said to place the bowl over shimmering water...can you explain please. As it is obvious that i am a new baker wannabe. And how can it not touch the water?? You can use a double boiler. 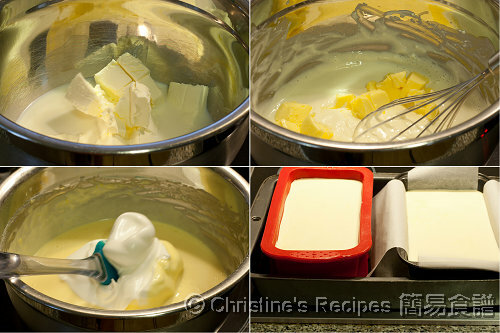 Or use a larger bowl to pour in the milk and cheese, shown in the upper left and right pictures on this post, then put on top of a deep pot of simmering water. The idea is to use the heat of the simmering water to help melt the cheese. can i sub cake flour with whole wheat cake&pastry flour? Thanks for your love of my recipe. Your cheesecake looks so fluffy and soft, very tempting. 1. I made caster sugar by taking regular granulated sugar and whizzing it in a Magic Bullet a couple of times. Seems to have worked. Thanks for the recipe. Everything went well except that after 70mins baking, the bottom half is still not well baked and the top is browning. Next time I'll try without the water & the big tray. I don't mind if the cake crack at the top 'cos after you refrigerate them, it's not noticeable. Also, I've placed the trays in the middle of the oven. Maybe putting it at the lowest tray will give me a more thorough bake. Saw your pictures. Your cheesecake looks very smooth and fluffy, only with a bit of crack on top. It doesn't hurt anyway. Congrats on your attempt! (1) refer to method 2, at that point of time do i turn off the fire. My cheesecakes cracked even though temperatures were around 150C (I used an oven thermometer) but I guess it's because I didn't put enough water in the pan. Also, do you peel off the paper before or after the cheesecakes cool down or does it not matter? To bake this cheesecake is quite challenging. The cake tends to crack on top. Just to add water halfway of your tray, top some more up if necessary. I sometimes peel off the paper after cooling on wire rack, sometimes I don't, as I can store the cake in a plastic container, then I can take it out easily with the paper. When I baked the cake last night, it turned out wonderful. It's just that when I cut it, unlike your picture, it crumbled everywhere. Can you tell me what should I do to avoid this please? Chill the cheesecake in fridge for a few hours, then it's easier to slice nicely. normally how long to preheat the oven before we put the batter into the oven? how long it take to preheat the oven before put the batter into the oven? Normally, it takes 10 minutes or so. @Christine Ho thanks for your reply. anyway what kind of cream cheese you use? is it Philadelphia or the one written as "cream cheese"? thanks for your reply. anyway what kind of cream cheese you use? is it phildelphia or the one written as "cream cheese" only? I have just tried this recipe. The upper half of my cheesecake turned out great, but the lower half was still wet... In fact I decided to make only one pan of the cake so I halved every ingredients but still have the same size of big pan to hold water and bake it in my big oven. Could you tell what is the problem? Do I have to get a smaller pan for water? Hi just wondering where about can I purchase tartar? Can you get from our local Coles/Woolworths or do you need to get it from a speciality food store? Hi, I have just change an oven, therefore I realise my cheesecake texture is not d same as before. Even after refrigerate it, when I cut it, it's sticks to the knife. My oven has a switch to whether to switch the fan on or not. Can you please help me urgently, please. Christine, can i use superfine flour instead of cake flour? I only used one Cake/Bread pan though...Could this be reason why it turned this way? Or is it something else? Wonder if the bottom heater of your oven is not hot enough? To get the best result, use cream cheese block with less moist content, then your cake won't be too moist. I got cream of tartar from Coles. Every oven is very different in design. The power and temperature monitored by the thermostat of your new oven is very different from your old one. Take some time to know your oven and you’ll get there.